I was listening to a news report on CNN yesterday covering this travesty surrounding the impending exit of Barack Obama and wife Michelle from the White House and as the commentator described the sequence of events leading up to the January 20th arrival of Mr. Donald J. Trump, you could detect a sense of melancholy in his voice, a faint trace of sadness, of loss, of hopelessness. And I was immediately taken back to the 1960s and the days of Walter Cronkite whose on-air persona was clipped and professional with the only emotion ever observed was when he had to announce the death of JFK in 1963. Those were the days when news was what reporters reported, when news was real, and when markets were free. Fifty years later, we have CNBC commentators commenting on their «interest rate models» (when the only models of which they are qualified to speak are the ones in the window of Macy’s) and news anchors sounding off on something DJT tweeted or the «safe space» of some liberal arts university being invaded by insult-wielding Trumpladites. I used to think my father got grumpier as he got older but he really didn’t; he simply grew less tolerant of the things he deemed «idiotic.» That is where I find myself as we roll into 2017 with global markets flirting with record highs despite record debt: GDP levels and borrowing costs on the rise. I am becoming less tolerant of all of the garbage spewed at us in order to make us believe that markets are fine, economies are growing, and gold is a barbarous relic of a bygone era. However, I have to constantly remind myself of the old adage which was given to me back in 1979 at the end of the inflationary 1970s: «Never underestimate the replacement power of equities within an inflationary spiral» as the printing presses continue to run feverishly with the most recent evidence being a $15 billion bond issue being floated by Italy’s Banca Monte Pasci, one of the oldest banks in the world. The investors buying into this totally insolvent financial institution are undoubtedly central banks or their surrogates such as Deutsche Bank or JPM so the issue being floated is really nothing more than yet another bailout designed to keep the global financial Ponzi scheme in motion. Now, there is nothing I would love to do this last day of the trading year than put on a massive bet against the stock markets for January but the problem is that you just cannot. Are the markets overvalued based up the Case Shiller P/E at 28.2 times? Of course. Is the S&P 500 index now rolling over with RSI rapidly reversing from an RSI reading above 70, the first such reading since November 2014? Absolutely. 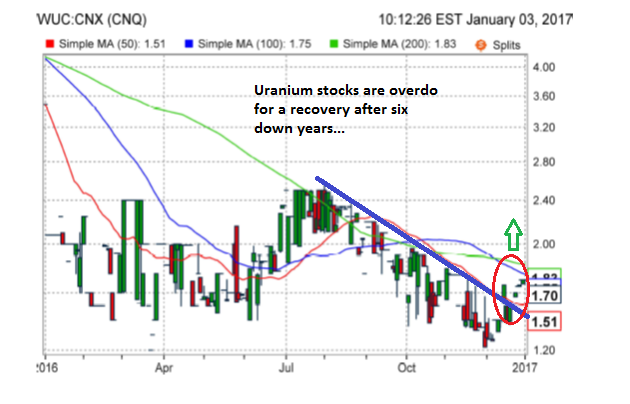 Are gold stocks cheap relative to where they were in July-August? Undoubtedly. Then why am I not buying the Gold Miner ETFs and pairing them with the SDS (short S&P500 ETF)? I will tell you why: the stock, bond, and precious metals markets are all linked, correlated, and managed by the coordinated global central banks with the NY Fed controlling the Americas, the Bank of England controlling Europe, and the Bank of Japan controlling Asia, ex-China and Russia. HFT-controlled algorithms are pre-programmed to respond to specific patterns in the markets such as dollar-yen, 10-year bond yield, and, of course, the gold price and all of this combines to create chaos for old-timers who were trained in a free-market environment without the magic hand of the price managers. Nevertheless, here are a few trades that I put on during the heat of the DJT advance; I was a tad early on all of them and this is what I will hold for the first few weeks of the New Year. 1. 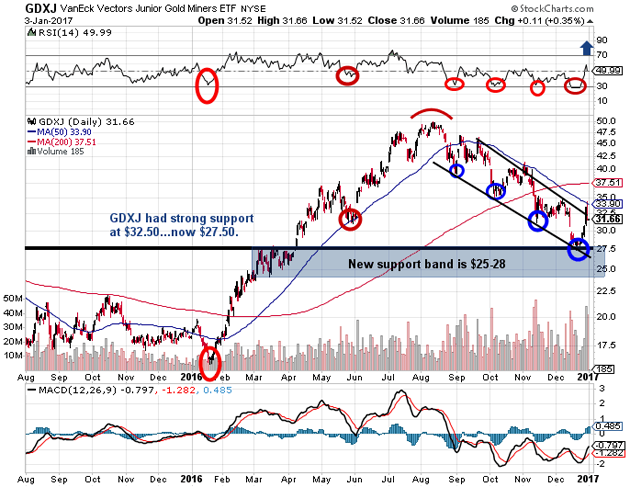 Long GDXJ: One look at the COT from last Friday tells me that the junior gold miners led by the GDXJ (VanEck Vectors Junior Gold Miners ETF) are once again back on the radar screen and I will be looking to add and possibly attempt to replicate the spectacular trade from last year. 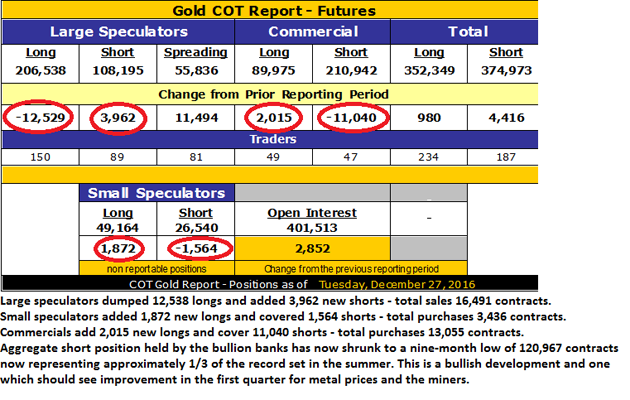 The Commercials have now pared that massive short position by two-thirds and are actually long nearly 90,000 contracts. Since the COT structure is now and finally in full «retreat mode» with the Commercials having booked an insane amount of bonus money for 2016, it would appear to this humble scribe that it has now become much less hazardous to go back into the water again, those ominous Deutsche Bank dorsal fins nowhere to be found nor those of their Commercial Carcharodan cohorts, HSBC, Scotia, and UBS. While the Commercials still carry over 12,000,000 phony ounces of synthetic gold on the books as a short position, it is doubtful whether we will see it near the incredible zero level of December 2015; accordingly, I hold a token position in the GDXJ via the Feb $35 calls and will add around the middle of the month, in all likelihood. 2. 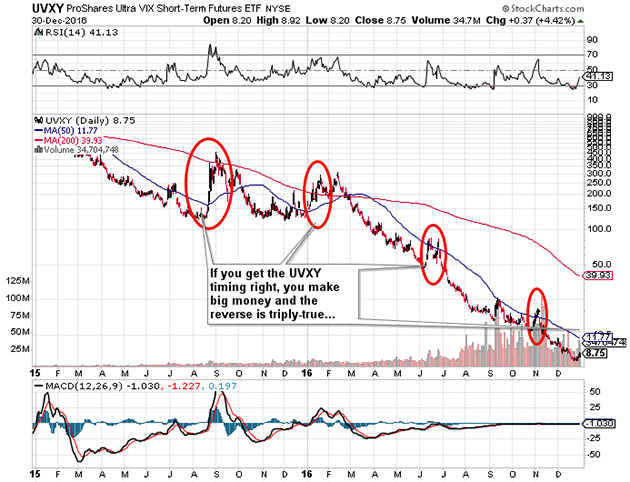 Long the UVXY (ProShares Trust Ultra VIX Short) from $14.50: I was REALLY early (wrong) on this one as it bottomed at 10.93 a few days ago and I refused to average down because of the leverage that caused the erosion in this little hellion. However, you only have to catch it right once and it can make you a lot of money and that is what I see in January. 3. 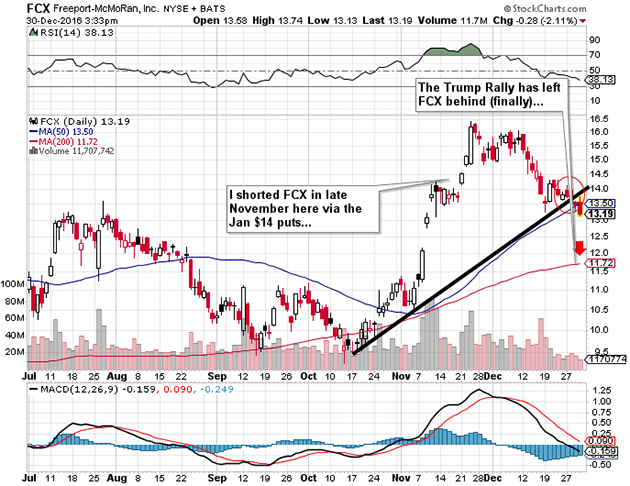 Short Freeport-McMoRan Inc. (FCX:NYSE) at around $14.40, I will hold this looking for a return to the 200-dma at $11.72. The company lost a boatload of money this year and had a big management shift. On Dec. 30, the market opened higher by over 150 Dow points with China «data numbers» kicking the algobots into «Buy Commodities» mode giving FCX a shot in the arm and the VIX a shot in the chops. As you look back three months from Feb. 1, 2017, we’re all going to have an epiphany and realize that we should all have «bought the election and sold the inauguration» but I think that stocks will begin to discount that by end of this week. Institutional money flows favor up markets in the first few trading session of January which is why I usually take the pulse of the markets after the first five trading sessions, again at mid-month, and then at month-end to get a feeling for how the year MAY progress. Mind you, it was a great deal simpler before interventions, algobots, and soon-to-be Commander-in-Chiefs firing off tweets every five minutes about official U.S. policy on trade, markets, and foreign affairs. If there was one simple resolution I made for 2017, it was to refrain from letting the constant shenanigans that prevail in the markets in which I toil lure me into «aberrant» as opposed to «abhorrent» behaviors that will affect those that live with and around me. However, reading that DJT threatened General Motors with a «border tax» for building cars in Mexico, you have to wonder what this wonderful New Year truly has in store for us.